Contrary to popular opinion, the coup of 20 July 1944 was not the first attempt by Germans to bring down the Nazi regime. The first conspiracy against the Hitler and his criminally aggressive policies pre-dated the out-break of the Second World War. Furthermore, it was arguably the conspiracy with the greatest objective chances of success. It was headed by the Chief of the German General Staff at the time, Franz Halder, and supported by many senior army generals including the later Field Marshal Erwin v. Witzleben and General Carl-Heinrich von Stülpnagel. 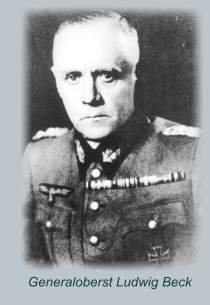 The intellectual and moral guidance of this first conspiracy came, however, from the same man who would inspire and mentor all the latter coup attempts against Hitler: Generaloberst Ludwig Beck. 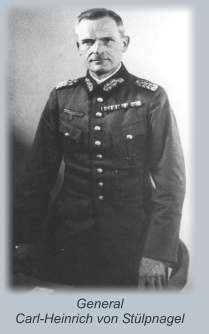 Beck had succeeded General Adam as Chief of the General Staff on 1 October 1933. At the time of his appointment, he still hoped that Hitler's government would be a positive force for change, restoring Germany to its place as a European Great Power with an army commensurate to its legitimate defensive needs. Beck supported the policies of the Nazi government to dismantle the repressive measures of the Versailles Treaty, but at no time did he share Hitler's aggressive goals. Beck firmly believed that any attempt to obtain territory by force would lead to a two front war, which Germany would inevitably lose. Beck, furthermore, was horrified by the methods employed by the Nazis to suppress opposition domestically. Yet despite increasing unease over Hitler's domestic and international policies, Beck's crisis of conscience did not come until 1938. In March 1938, Beck was given orders to prepare the invasion of Hitler's homeland, Austria. Beck believed that the Austrian army would offer resistance. Although there was little doubt that the German Army would win this war with Austria, Beck was appalled by the idea of Germans killing other ethnic Germans. Beck therefore initially refused to prepare the invasion, but he capitulated when told that if he did not, the task of invading Austria would be turned over to the Nazi paramilitary organisation, the Sturmabteilung, or SA. In the event, the German army was met not with resistance but with flowers and swooning maidens – a spectacular success for Adolf Hitler. Beck, however, was not taken in by the success, and when only a few months later Hilter announced his intention to seize the ethnically German parts of Czechoslovakia, Beck immediately started protesting. Strange as it may seem today, as Chief of the German General Staff Beck did not have direct access to Hitler. His only means of protesting the proposed military action (which he would be expected to prepare and plan) was to write memorandum to the Commander-in-Chief of the German Army, General von Brauchitsch, in which he drew attention to the risks associated with the proposed operation. When staff exercises suggested that the German Wehrmacht might indeed be able to crush the resistance of the Czech armed forces in just five days, Beck's protests only became more passionate. Beck was not opposed to the tactics or timing of such an invasion: he opposed the very act of aggression against a sovereign state. The very existence of the nation is at stake. History will attribute a blood-guilt to leaders that do not act in accordance with their professional expertise and political conscience. Your military duty to obey [orders] ends where your knowledge, your conscience and your responsibility forbids the execution of an order. If in such a situation, your advice and warnings are ignored, then it is your right and your duty before the Nation and History to resign from your positions. What Beck hoped was that the commanding generals of the German Army could be moved to resign in a collective, simultaneous gesture. This, he hoped, would prevent Hitler from pursuing his aggressive plans. Beck did not believe that Hitler would back down in the face of this collective refusal to engage in an aggressive war. On the contrary, he expected a domestic confrontation between the Army and the Nazis, including the SA and SS. Beck's aim was not merely to stop the aggressive war planned by Hitler, but rather to bring down the entire Nazi regime. He urged the Commander-in-Chief of the Army to use the inevitable confrontation "to restore the rule of law" in Germany. Beck even recommended the slogans the Army should use to explain their actions to the population. Significantly, he suggested not just "Stop the War!" but also "Peace with the Church!" "Free Expression of Opinion!" and "Down with the Secret Police!" Not all of Germany's generals shared Beck's abhorrence of the Nazis and their polices, however, and so not all were willing to risk a confrontation. 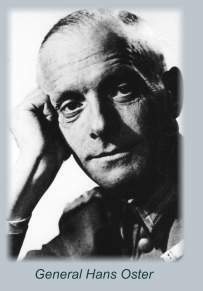 In the absence of unanimity among the Army's leadership, Beck could not hope to win a confrontation with the Nazis, but he was still not willing to accept the "blood guilt" of acting against his better judgement and his conscience. He resigned. While not all generals in the Army supported Beck, by no means did all oppose him. Generals von Witzleben and von Stülpnagel, supported by Hans Oster in the Counter Intelligence Agency, were just as opposed to the Nazis as Beck. These men, under the leadership of Beck's immediate successor, Franz Halder, chose to pursue Beck's goal of bringing down the Nazi regime by employing conspiratorial – rather than confrontational – means. The first loose ties were established to civilian leaders equally outraged by the Nazis, and a plan was forged to arrest Hitler and try him either as a traitor or have him committed to a mental institution. The entire action, which included detailed orders down to divisional level for the seizure of key installations and the effective disarming of the Nazi paramilitary organisations, was to be triggered by orders to invade Czechoslovakia. The reasoning was simple. The German people were terrified of a new world war. They had suffered bitterly in the First World War and they adored Hitler because he had reversed many of the humiliations of the defeat suffered in 1918 without war. The leaders of this military conspiracy firmly believed that if the German people saw Hitler was risking a new world war merely for the sake of annexing the ethnically German portions of Czechoslovakia, than they would stop supporting him. Unfortunately, the French and the British had also suffered bitterly in the "Great War" and despite being the victors they were reluctant to risk a new war. So at the last moment, the British and French caved in. They allowed themselves to be talked into a "peace conference" with Hitler and signed away the territorial integrity of a sovereign state (Czechoslovakia) they had helped create in 1919 and guaranteed. They accepted Hitler's word that the Sudetenland was his "last" territorial ambition, and called the agreement "Peace in our Time." So the German Wehrmacht marched triumphantly into the Sudetenland without a shot being fired. Under the circumstances it was impossible to arrest the successful dictator on the grounds that he was mad. The coup with the best chances of success did not take place, and the conspirators went their separate ways. Contents of this web site are copyrighted. ©1993-2012 Helena P. Schrader unless otherwise noted. If you would like to use the material of this site, please contact Helena Schrader. If you experience any problems with this site, please contact the web mistress.